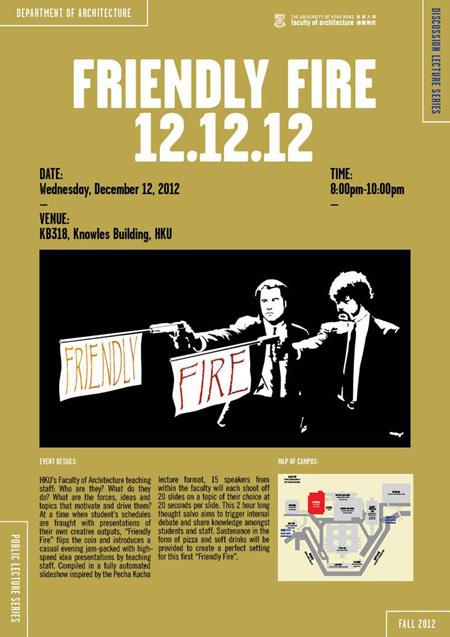 Christian J. Lange to deliver a talk as part of the Friendly Fire event at the Department of Architecture, The University of Hong Kong. HKU’s Faculty of Architecture teaching staff: Who are they? What do they do? What are the forces, ideas and topics that motivate and drive them? At a time when student’s schedules are fraught with presentations of their own creative outputs, “Friendly Fire” flips the coin and introduces a casual evening jam-packed with high-speed idea presentations by teaching staff. Compiled in a fully automated slideshow inspired by the Pecha Kucha lecture format, 15 speakers from within the faculty will present their thoughts and ideas.